I knew it was going to be a good night of pizza when Jon F. and Sandi showed up with smiles of their faces. They were anxiously anticipating going to Sally�s Apizza for the first time. We arrived at Wooster Street, 30 minutes before Sally�s opened. We were first in line. Jon and Sandi guarded our spot, while Charlene and I took Kamalei to ride the swings in a nearby park. We came back just in time to see the lights of Sally�s twinkle on. 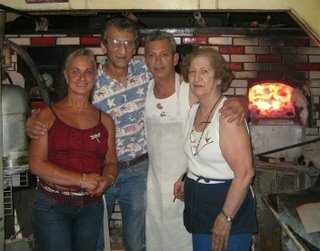 Stepping into Sally�s Apizza is like going back in time. From the moment you walk in the door you are transported to a different era. The d�cor is simple and functional. The booths are cozy and comfortable. Rick Consiglio, son of Sally (Salvatore), showed us our table and then handed us our menus. He explained there were several pizzas that were not on the menu. We opted for a large clam, a large pepper and mozzarella, and a small potato and mozzarella. I also ordered a small pepperoni to go. The Family had instructed us, to not return home, unless we brought back a Sally�s pizza. Each pizza was unique and memorable. The crust was superb. The potato pizza, which we had sampled on our last visit, was a show stopper. Lightly seasoned with just a hint of rosemary, all of the toppings blended together to create a wonderful taste. The clam pizza, was extremely tasty and satisfying. The crust was thin but did not bend under the weight of the toppings. These were happy clams. Scrumptious clams. The pepper and mozzarella was quite tasty and understated. The sweet peppers complimented the amazing crust. We were all totally satisfied. Even Kamalei insisted I take her picture while she was eating a slice of pizza. She wanted to remember the moment. Sally�s is truly a family operation. Rick works the �front of the house�. While brother Bobby, works �the back of the house�, making pizzas. Sister Ruth, helps out at the register. Flo, Sally�s wife, was all over restaurant, helping wherever she could. She looked years younger than the last time I had seen her. I would love to know her secret. She is the glue that holds the family together. Sally himself passed on several years ago. He would be quite pleased to see his family continue the legacy. This is truly a family operation. Each member contributing to make sure the operation runs smooth. Sally�s Apizza is like no other pizzeria on the planet. I am sure the Consiglio�s would have it no other way. 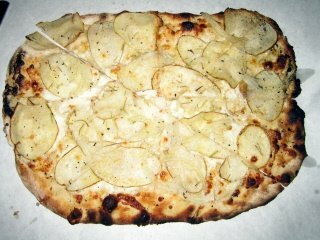 The potato pizza at Sally's Apizza!